Do you have a problematic air duct in your home? Then you are probably experiencing one of these frustrating issues in your place. The air duct is an important component of your home’s comfort system. But with leaks and cracks, it starts to work against you. Walk through your home and check if your indoor air feels stuffy and dry. Do you also feel hot and cold spots and uneven temperature on some parts? These are all caused by a leaky air duct. The leaks allow the conditioned air to escape into the great outdoors, leaving your home with insufficient cool air. Leaky air ducts not only allow conditioned air to move out of the system but it also lets the dirty outdoor air to enter and join the air that moves toward your home. As a result, you will be introduced to a polluted indoor environment. This is especially hazardous to family members who are sensitive to allergens and with respiratory health concerns. Since the leaks in your ducts allow the conditioned air to escape, your air conditioning system needs to work harder and longer to suffice the needed cooling of your home. And the constant running of your unit can lead to the high possibility of system repairs, even if you have a brand new unit installed. 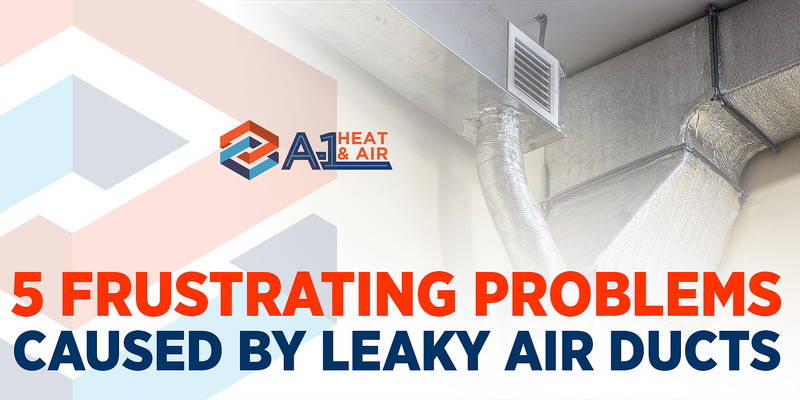 Additionally, leaky air duct can lead to debris accumulation in the different parts of the system which causes it to break down. Backdrafting can also contribute to poor indoor air quality, and a leaky duct can cause it to happen in your home. As vented appliances like gas furnaces and water heaters send fumes outdoors, the leaky ducts could be sucking some of these fumes back into your home. This is not just an expensive issue but a pretty dangerous problem to deal with. No one wants to have an extremely high energy bill to pay, but you can’t save yourself from it if you have a leaky air duct in your home. It always feels like you are not getting your money’s worth from the performance of your HVAC system. Since your duct is spilling the precious air while making your unit work harder and longer, your wallet will surely feel the squeeze. As one of our valuable clients, we never want you to experience any of the following issues mentioned above. That is why we see to it that we are able to assist you and help you get over your leaky air duct concern. If you need assistance and quick service, feel free to give us a call at A-1 Heat and Air Conditioning today!